Return with us now to those thrilling days of yesteryear when Real Men with ray guns and beautiful women in beguiling outfits battled hideous monsters from outer space! Return with us to the days when Captain Proton ruled the skyways! When the queen of an evil space empire kidnaps Captain Proton's faithful secretary Constance Goodheart, it's only the first step in her diabolical plan to conquer the Incorporated Planets. 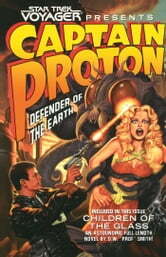 It soon becomes clear that there is more to her plot than meets the eye when, on the very edge of death, Captain Proton is saved by a power Not Of This Universe. Caught in an eons-old fight between two alien races, who can Captain Proton trust? No one -- not even his sidekick, ace reporter Buster Kincaid. Can Captain Proton save the Galaxy from the forces of evil and save Constance Goodheart from the Giant Demon Squid of Greyhawk II? Extra! Dr. Chaotica plots the Death of the Patrol, Constance Goodheart must find Captain Proton before she shrinks to a size too small to be seen, and Buster Kincaid faces the Swamp of Doom!